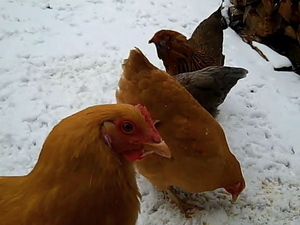 Posted on Sun, Apr 8, 2012 : 12:45 p.m.
Ypsilanti Township resident Jaclyn Baublit was recently fined and ordered by a judge to remove five hens she and her husband raised behind her Ypsilanti Township home. Now, a group Ypsilanti Township residents are preparing to attend the Board of Trustees’ Monday night meeting and present officials with what they say is language for a fair ordinance that will allow backyard chickens in the township. Currently, residents aren’t permitted to have poultry, livestock or an agricultural farm on land less than five acres of land. Baublit’s property on Lexington Parkway is less than five acres, so her five hens aren’t permitted. Township officials weren’t immediately available to comment on the situation. Township ordinance officials left a warning on Baublit’s door alerting her to the ordinance violation. When Baublit still kept the chickens after a second warning, the township took Baublit to 14-B District Court. Judge Charles Pope ruled in favor of the township because raising poultry on that small of a parcel clearly isn’t allowed under the current ordinance, and Baublit said she voluntarily got rid of her chickens. The chickens provided fresh eggs for Baublit and her husband, which she prefers because they organically fed, free-range chickens. She said the eggs are healthier and she knows where they come from, and she regularly provided extra eggs to neighbors, friends and family. Baublit said she gathered 80 signatures for a petition supporting a new ordinance that allows backyard chickens, and she is working on drafting proposed ordinance language to present to the township board with a small group. Baublit said she was unaware of the current ordinance because she moved to the township from the City of Ypsilanti, which already has a backyard chicken ordinance. Chelsea also recently passed an ordinance addressing the issue. “I want the ordinance changed, but have the chickens be regulated,” Baublit said. "I want responsible people to own backyard chickens. I want them to be able to do it and do it responsibly. Just like if you have a dog." The chickens were kept in a 4-foot by 12-foot coop that was formerly a small dog kennel, and Baublit said she supervised them while they were out in the yard. Baublit said there are other homes in her neighborhood and the township with backyard chickens, but she was targeted because her neighbor complained. But she said most of her neighbors support her. “Who wouldn’t want to have free, fresh eggs everyday from their neighbors?” she asked. Tue, Apr 10, 2012 : 3 a.m.
Tue, Apr 10, 2012 : 1:40 p.m. This is a great point and one that I have put considerable amount of time researching. The only point of contention in the MRTFA is the definition of commercial. The court case Charter Township of Shelby v. Papesh the court states: &quot;Words that are not defined by a statute will be given their plain and ordinary meanings, and a court may consult dictionary definitions when ascertaining those meanings. ?Koontz, supra at 312, 645 N.W.2d 34.&quot; So, basically it is up to the court to determine if it is commercial, or in contrast the municipality to go ahead and define commercial. That being said, I agree she should just bring her chickens back but fighting a township in court is MUCH more difficult then just getting an ordinance changed, which is what we are doing. Also, MRTFA doesn't protect those who just want chickens for there own benefit and don't want to be bothered with commercial endeavors. Tue, Apr 10, 2012 : 12:12 a.m.
FREE teh chickens!! Let there be EGGS!! Mon, Apr 9, 2012 : 5:52 p.m.
Why does the movie and the book &quot;Flipped&quot; come to mind? Need to read the book in order to know where I come from. Good article. Tue, Apr 10, 2012 : 1:06 a.m. Thanks for the suggestion, but I'm not reading a book to understand a three sentence comment that provides no insight. Tue, Apr 10, 2012 : 12:58 a.m.
Mon, Apr 9, 2012 : 7:50 p.m.
Mon, Apr 9, 2012 : 5:40 p.m.
Mon, Apr 9, 2012 : 10:21 p.m.
Mon, Apr 9, 2012 : 7:54 p.m.
Nancy, I hope that even despite your complaint, you can still see the value in passing an ordinance that works for everyone. If what you say is true--that there was an unreasonably foul smell--even with an ordinance passed allowing chickens, you'd still be able to report a violation. I'd assume any ordinance would have a piece that requires the owners to maintain a clean, healthy, and secure environment. Mon, Apr 9, 2012 : 6:12 p.m.
Michigan Right to Farm offers protection if Jacki does decide to commercially market and sell her eggs. It also preempts any local ordinances or zoning which prohibit her from doing so, but that's a different story all we want is to have the ability to grow and raise our own food. Mon, Apr 9, 2012 : 4:05 p.m. This is about a bigger movement altogether. The right for people to sustain their own living where they choose. A 0.15 acre lot is big enough to have a garden, a couple chickens and a fruit tree or two. The comments about moving to the country if you want chickens are unrealistic and socioeconomically prejudice, a 0.15 acre lot is perfect for living a financially responsible and sustainable life. The comment about Mexico could be made about many other areas in our country (i.e. WV, KY, TN....) where 50-100 chickens run around everywhere with no particular care from their owners. The way in which we here in Ypsi want to own chickens is much cleaner and more responsible than anything most people have ever seen. Lastly, the current &quot;ordinance&quot; is rather broad and hidden in the municipal code, once you find it Appendix A - Zoning, Article IV Sec. 401(2) paired with Article II Sec. 201(Farm), it simply states that in order to farm you must have at least 5 acres, and the definition of farm includes every agricultural activity except gardening. So, it is completely conceivable that someone could simply not know or even search and try to find the ordinance and come up with no reason why they should not be allowed to have chickens. Mon, Apr 9, 2012 : 3:38 p.m. There are many other residents in Ypsilanti Township that have egg laying chickens in neighborhoods similar to Ms. Baublit's, so this really is solid evidence that the ordinance is long overdue for an update to reflect what people in this community are doing. The one bad neighbor who reported Ms. Baublit should be dragged into court and fined just like they did Ms. Baublit, but for all the trash in her backyard. As for me, I would much rather have a neat well maintained chicken coup next door instead of a heap of trash piled five foot high to look at. The audacity of this one bad neighbor is hard to understand. I'm all for well maintained properties regardless if they have chickens or not. And... as for the one really ignorant commenter, chickens in Mexico are a lot different than the ones we have here. They are game birds that make noise and fly; ours don't make noise and they don't fly. Mon, Apr 9, 2012 : 2:06 p.m.
- The Township ordinance is not altogether clear which can confuse many and leave many to wonder and question. - A few backyard hens (not roosters) are not noisy or smelly when taken care of. - Barking dogs are a pain and in fact there is an ordinance on the number of pets neighbors are allowed. - There is a noise ordinance for barking dogs (that is really difficult to call in and never taken care of). - Eggs from backyard birds are fresher and more healthy than any you can buy, except possibly those purchased at a local farmers market. - Teaching children about where their food comes from is priceless! I know all of this because I fought this fight a few years back and gave in as well. I just couldn't continue to fight when my spouse lost his job, so we sadly sold the girls to a friend. We never even got to see the full cycle repeat as we had to sell the girls just before they began laying eggs. My family raised three hens for eggs, they were clean, well taken care of and not allowed to free range. The neighbors three dogs, and nearby pond fountain were many decibels louder than any clucking could have possibly been. Yet an uninformed neighbor decided to complain after we'd had the girls for 5+ months, which is far past the point where they had become &quot;pets&quot; to the children. As families, and Township homeowners we should be able to have a few backyard hens. Period. I'm very disappointed that I can not be at the meeting tonight to support the effort due to a previous commitment with my scouts! Let's get that backyard chicken ordinance cleared!!! I'll defiantly be in line to get that permit when it is opened for application. Mon, Apr 9, 2012 : 1:18 p.m. I'm much more concerned about the alektorophobic control freaks that infest local governments than any chickens. Feeding food-like products loaded with petrochemicals and other synthetic toxins to Ypsilanti school children is perfectly OK because our federal minders certify it but watch out for backyard chickens? Mon, Apr 9, 2012 : 10:39 p.m.
Mon, Apr 9, 2012 : 2:40 a.m.
My favorite part of the article is the dig on Mexico out of nowhere. Mon, Apr 9, 2012 : 7:02 p.m. There are a lot of loose chickens running around in villages in Mexico. At least the ones I've been to. It's not racist to say that. It is accurate. Mon, Apr 9, 2012 : 12:33 p.m.
Why some people have to bring race into everything? The same thing happens in key west, is it racist for me to say that? What is racist about chickens in mexico? Can you say &quot;Thin skinned&quot;? Mon, Apr 9, 2012 : 12:27 p.m.
Mexico is a country, not a race! You're the one implying the racial aspect. Mon, Apr 9, 2012 : 2:44 a.m.
Oh yeah, don't you love the not-so-veiled racism embedded in that statement! Mon, Apr 9, 2012 : 2:10 a.m.
Mon, Apr 9, 2012 : 1:20 a.m.
Chickens are the least of the township's challenges. Regulate them if you must but permit them. Chickens have been a wonderful addition to Ypsi City. Freshness matters with eggs and really fresh eggs from chickens who are appropriately cared for have a rich flavor and brightly colored yokes. Its a wonderful thing! Mon, Apr 9, 2012 : 1:14 a.m.
Granted I have not lived with nor near chickens, but I can not imagine that 5 hens would make nearly as much noise as even one single barking dog, let alone 2 or more. Luckily for me my neighbor's dog isn't the barking type - but 3 doors down is another story. Maybe people shouldn't be allowed to have noisy dogs either (I'm sure there's an ordinance but owners of barky dogs choose to ignore it until a fed up neighbor finely makes it an issue). I happen to like dogs - but I am annoyed by constant (as opposed to occasional) barking. Mon, Apr 9, 2012 : 11:32 p.m. I don't think hens make a lot of noise. It's roosters that crow. Barking dogs are a real annoyance and there is a reason dogs bark. They are unhappy or agitated or angry, etc. I don't know about the smell generated from keeping hens would manifest in the hot summer. I would not want to live next door to chicken coops that were smelly. I don't know enough about it to say whether it is a fact of life in raising chickens or if the strong odors are the result of not cleaning coops often enough. If someone has a tiny city lot, then chickens could be a problem for neighbors regardless of how responsible the owners are. I think there should be minimum dimensions to yards that allow chickens. Sun, Apr 8, 2012 : 11:58 p.m. Houses on Lexington Pkwy are on much less than 5 acres of land. The lots are only 0.13 acres - that's 7-8 houses per acre - and are only a few feet apart, so outdoor chicken coops would have to be cleaned daily and the noise would likely annoy neighbors. Imagine five hens in every yard, 35-40 hens per acre. The chicken feed will offset any noticeable savings at the grocery store. And the eggs don't taste any better - http://www.washingtonpost.com/wp-dyn/content/article/2010/06/01/AR2010060100792.html?sid=ST2010060101402. Mon, Apr 9, 2012 : 2:01 a.m. Anyone can put their opinion on the internet. You need to get the facts buddy. Read a book! Mon, Apr 9, 2012 : 1:17 a.m.
Sun, Apr 8, 2012 : 11:55 p.m.
She &quot;voluntarily&quot; gave up her chickens...after blatantly violating the law, ignoring two warnings from the government based on a complaint from her own neighbor, and getting taken to court? That' voluntary? I'll give you that she ignored the two warnings, but if you can cite the law she violated I'd be curious. Mon, Apr 9, 2012 : 2:53 a.m.
Sun, Apr 8, 2012 : 11:13 p.m.
Sun, Apr 8, 2012 : 8:27 p.m.
Ms Baubilt is quoted as wanting to raise chickens &quot;responsibly,&quot; yet she proved the opposite by raising chickens in contravention of the ordinance, by then pretending ignorance of the ordinance, and then refusing to comply with the ordinance after two warnings and a court date. This is responsibility, it is anarchy. Btw, the claim that store-bought eggs are &quot;well over a month old&quot; is false--why would a &quot;just in time&quot; industry like supermarkets park eggs for a month so that they can increase costs? Silly. Mon, Apr 9, 2012 : 12:24 p.m.
Sun, Apr 8, 2012 : 8:18 p.m.
&quot;...., and she regularly provided extra eggs to neighbors, friends and family. &quot; Oh, well if she would have just said that in the first place, I'm sure there would have been no issue. Mon, Apr 9, 2012 : 2:51 a.m. They want you to buy eggs from the store to keep their stocks up. This is a township, not a village or city. On the other hand, I would hate a rooster crowing at first light, I would probably want them gone too. Sun, Apr 8, 2012 : 7:19 p.m.
Sun, Apr 8, 2012 : 6:40 p.m. Nothing wrong with raising chickens in your backyard as long as there isn't any noise, pollution, or nuisance that impinges on neighbors because of it. It's a good idea in theory; I don't know how it works out in practice in backyards. Most people would agree that fresh eggs from hens you raise is a good thing, but there is a certain amount of work involved, and hens can't be left without regular care. You can't legislate responsibility, but I agree that responsible people should be able to raise a few hens for eggs on their property. Mon, Apr 9, 2012 : 6:58 p.m.
Oh no! Not noisy chickens near your pool! Mon, Apr 9, 2012 : 6 p.m.
Hey Jed Clampet you are in the city now. How would you like to have a million dollar house with some stinky noisy chickens 10 ft from your pool. Sun, Apr 8, 2012 : 6:32 p.m.
People can breed and train pitbulls in Ypsi backyards, despite a history of dog fighting. But not chickens. Maybe someone should sell those disguise kits - to make the chickens look like dogs. Sun, Apr 8, 2012 : 7:41 p.m.
maybe if cockfighting were part of the picture it'd be allowed. This will be a topic of discussion at the Ypsilanti Township Board of Trustees meeting tomorrow 4/9 @ 7PM, I have heard.